The potential benefits of less cultivated varieties of cereals are garnering more interest in a drive towards healthy nutrition. While important strides have been made in European and global agriculture, the strategy up to now has led to dependence on mineral fertilisers, high energy input, less genetic variation and reduced diversity. This renders crops more vulnerable to biotic and abiotic stresses and has negative environmental impact. In the EU, cereal production is based on three main crops: wheat and barley (classified as major cereals) and maize. These presently make up over 85 % of cereals produced and are grown on some 78 % of the total cereal cultivation area. Cereals such as rye and oats are classified as minor cereals and grown on a much smaller area. A team of researchers on the HEALTHYMINORCEREALS project is making the case for a shift in attention to minor cereals. Compared to conventional common wheat, minor cereals have been shown to retain a higher concentration of micronutrients. They grow well in poor soils and don't require high external input conditions. At the same time, more and more research highlights the health benefits of eating a range of natural foods. Each minor cereal has its own unique set of nutritional and bioactive compounds that industrial food fortification just cannot match. It comes as no surprise then that producers and consumers of organic foods and, more and more, conventional farmers place high value on these crops. Project efforts are focused on rye, oats, spelt, einkorn and emmer – five species of cereals that are presently not widely cultivated. This was not always the case, however. An 'Open Access Government' environment report explains that at one time oats and rye were widely grown in certain European areas. However, oats have over the last six decades "declined to a minor cereal" and rye has more recently been "largely replaced by higher yielding common wheat." Cultivation of rye and oats mainly takes place in eastern and southern Europe and Turkey, and spelt is also grown in Germany and Switzerland. The article notes there is no data available for the last five years on EU production and cultivation areas of emmer, einkorn or spelt. While this underlines lacklustre economic interest in these crops, studies by HEALTHYMINORCEREALS could bring about major change. Having tested over 600 genotypes of rye, oats, spelt and their wild relatives, project researchers "found much higher levels of total antioxidants in these minor cereal species in comparison to the tested currently cultivated varieties of common wheat." The environment report further quotes: "It is absolutely crucial that we ensure human nutrition by growing biodiversity and offering our consumers naturally nutritious food, and not to industrially fortify nutritionally-poor highly processed products." Evidence supports that agricultural systems sporting high biodiversity can adapt better to changing environmental conditions. It stands to reason then that actions encouraging such biodiversity are essential for ecosystem robustness and sustainability. 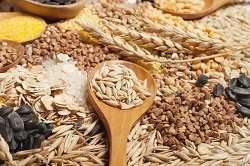 HEALTHYMINORCEREALS (An integrated approach to diversify the genetic base, improve stress resistance, agronomic management and nutritional/processing quality of minor cereal crops for human nutrition in Europe) is working to meet consumers' demands for nutritious, innovative and healthy food that is produced sustainably. Could ancient wheat be the future of food?